HOUSTON - Former US President George H.W. Bush's family took center stage at his funeral at a Houston church on Thursday, with grandsons who knew him better as "Gampy" serving as honorary pallbearers and his granddaughters reading from the Bible. Bush, the 41st US president, died last week in Texas at age 94. His remains were flown to Texas on Wednesday evening after a state funeral at Washington's National Cathedral attended by US President Donald Trump, the four living former US presidents and foreign leaders. 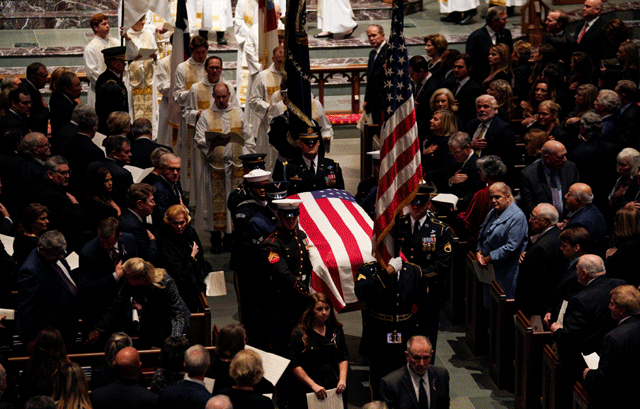 The service began at St. Martin's Episcopal Church, where Bush worshipped for more than 50 years, with more than 1,000 attendees singing America the Beautiful. The flag-draped casket was carried in soon after. George P. Bush, son of former Florida Governor Jeb Bush and one of the former president's 17 grandchildren, reminisced about fly fishing and sharing Blue Bell Creameries ice cream, a well-known Texas brand, as a child with the man he called "Gampy." James Baker, who served as Bush's secretary of state and was a longtime friend, eulogized the former president as a peacemaker and "a truly beautiful human being." "He was not considered a skilled speaker, but his deeds were quite eloquent and he demonstrated their eloquence by carving them into the hard granite of history," Baker said, his voice cracking at moments, summarizing Bush's accomplishments in foreign policy. Mourners laughed as Baker recalled how Bush would let him know a conversation was over: "'Baker, if you're so smart, why am I president and you're not?'" Country music star Reba McEntire was due to be among the musical performers at the service.Following the funeral at St. Martin's, a train will carry his remains about 130 km northwest to College Station, Texas, where he will be laid to rest at his presidential library. The train is a Union Pacific Corp locomotive, numbered 4141 and bearing the name "George Bush 41" on the side that has been in service since 2005.Bush, who narrowly escaped death as a naval aviator who was shot down by Japanese forces over the Pacific Ocean in World War Two, will be buried with military honors, including a flyover by 21 aircraft from the US Navy. He supported the passage of the American with Disabilities Act, a major civil rights law protecting disabled people from discrimination.A patrician figure, Bush was voted out of office in part for failing to connect with ordinary Americans during an economic recession. He has also been criticized for supporting tough drug laws that led to the disproportionate incarceration of black people, as well as what activists call an insufficient response to the AIDS epidemic when he was in power during some of its deadliest years.